MC9190-G, Wi-Fi (802.11a/b/g), Long Range 1D Scanner, Windows Mobile 6.5, 256MB RAM/1GB ROM, 43-Key keypad, Bluetooth. Interface cables and charging cradle sold separately. Single slot charging cradle kit (Part# CRD9000-110SES). Quad slot charging cradle kit (Part # CRD9101-411CES) requires AC line cord (Part# 23844-00-00R). 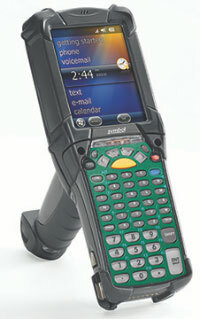 MC9190-G, Wi-Fi (802.11a/b/g), Long Range 1D Scanner, Windows Mobile 6.5, 256MB RAM/1GB ROM, 28-Key keypad, Bluetooth. Interface cables and charging cradle sold separately. Single slot charging cradle kit (Part# CRD9000-110SES). Quad slot charging cradle kit (Part # CRD9101-411CES) requires AC line cord (Part# 23844-00-00R). MC9190-G, Wi-Fi (802.11a/b/g), 1D Scanner, Windows Mobile 6.5, 256MB RAM/1GB ROM, 53-5250 keypad, Bluetooth. Interface cables and charging cradle sold separately. Single slot charging cradle kit (Part# CRD9000-110SES). Quad slot charging cradle kit (Part # CRD9101-411CES) requires AC line cord (Part# 23844-00-00R). MC9190-G, Wi-Fi (802.11a/b/g), 1D Laser Scanner, Windows CE 6.0, 256MB RAM/1GB ROM, 53-3270 keypad, Bluetooth. Interface cables and charging cradle sold separately. Single slot charging cradle kit (Part# CRD9000-110SES). Quad slot charging cradle kit (Part # CRD9101-411CES) requires AC line cord (Part# 23844-00-00R). MC9190-G, Wi-Fi (802.11a/b/g), 1D Scanner, Windows Mobile 6.5, 256MB RAM/1GB ROM, 53-3270 keypad, Bluetooth. Interface cables and charging cradle sold separately. Single slot charging cradle kit (Part# CRD9000-110SES). Quad slot charging cradle kit (Part # CRD9101-411CES) requires AC line cord (Part# 23844-00-00R). MC9190-G, Wi-Fi (802.11a/b/g), 1D Scanner, Windows Mobile 6.5, 256MB RAM/1GB ROM, 43-Key keypad, Bluetooth. Interface cables and charging cradle sold separately. Single slot charging cradle kit (Part# CRD9000-110SES). Quad slot charging cradle kit (Part # CRD9101-411CES) requires AC line cord (Part# 23844-00-00R). MC9190-G, Wi-Fi (802.11a/b/g), Long Range 2D Imager, Windows Mobile 6.5, 256MB RAM/1GB ROM, 53-5250 keypad, Bluetooth. Interface cables and charging cradle sold separately. Single slot charging cradle kit (Part# CRD9000-110SES). Quad slot charging cradle kit (Part # CRD9101-411CES) requires AC line cord (Part# 23844-00-00R). MC9190-G, Wi-Fi (802.11a/b/g), Long Range 2D Imager Windows CE 6.0, 256MB RAM/1GB ROM, 52-3270 keypad, Bluetooth. Interface cables and charging cradle sold separately. Single slot charging cradle kit (Part# CRD9000-110SES). Quad slot charging cradle kit (Part # CRD9101-411CES) requires AC line cord (Part# 23844-00-00R). MC9190-G, Wi-Fi (802.11a/b/g), Long Range 2D Imager, Windows Mobile 6.5, 256MB RAM/1GB ROM, 53-VT keypad, Bluetooth. Interface cables and charging cradle sold separately. Single slot charging cradle kit (Part# CRD9000-110SES). Quad slot charging cradle kit (Part # CRD9101-411CES) requires AC line cord (Part# 23844-00-00R). MC9190-G, Wi-Fi (802.11a/b/g), Long Range 2D Imager, Windows Mobile 6.5, 256MB RAM/1GB ROM, 43-Key keypad, Bluetooth. Interface cables and charging cradle sold separately. Single slot charging cradle kit (Part# CRD9000-110SES). Quad slot charging cradle kit (Part # CRD9101-411CES) requires AC line cord (Part# 23844-00-00R). The MC9190-G continues the flagship family of mobile computers from Motorola with a wide set of features and hardened design. 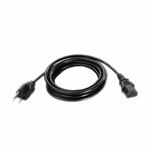 This device is found anywhere from the warehouse floor to stocking shelves at a big box retailer due to its flexibility. With its range of scanner options, standard laser, long range laser, and 2D imager, the MC9190-G has options the competing mobile computers donâ€™t offer while still maintaining a similar cost. The MC9190-G is a fit-for-all device for applications that have rough handling while working under a WLAN. If you do require cellular capabilities, the Motorola MC9500 series is the unit to go with though. Businesses that need a reliable and widely supported rugged mobile device use the MC9190-G daily to fulfill their application needs.